Recently, I created two new HIPAA training resources. I created a 1-page visual summary of HIPAA, which I call the HIPAA Whiteboard. The idea was to summarize HIPAA in a concise and visually-engaging way. You can download a PDF handout version here. We’ve been licensing it to many organizations for training and awareness purposes. I subsequently created a new training module — an interactive version of the HIPAA Whiteboard — the HIPAA Interactive Whiteboard. When people click on each topic, the program provides brief narrated background information, presented in a very understandable and memorable way. Trainees can learn at their own pace. This program is designed to be very short — it is about 5 minutes long. It can readily be used on internal websites to raise awareness and teach basic information about HIPAA. It can also be used in learning management systems. At the end of 2017, the OCR logged just under $20 million in fines for HIPAA violations from 10 enforcement actions with monetary penalties. In 2016, the total in penalties was roughly the same amount but from 15 organizations. Devices, devices, devices . . .
Quite a number of cases involved failure to implement safeguards for PHI on mobile devices. The best fix is to superglue devices to staff. Short of doing that, organizations should recognize that mobile devices frequently get lost or stolen, so there should be heightened security controls when PHI is accessible on these devices. Several cases involved failing to provide timely notice or to act promptly after problems were discovered. In politics, it’s often not the scandal, but the coverup that fells politicians. In the world of HIPAA, it’s often not the incident, but the response that leads to organizations being penalized. Illinois health care network, Presence Health, was fined $475,000 for failing to notify patients of a breach within the 60-day period. The incident took place over 3 years ago. In October 2013, operating room schedules that were written on paper and contained PHI of 836 individuals went missing. Patients were not notified of the breach until February of 2014. This represents the first enforcement related to the timeliness of breach notification. An insurance company, MAPFRE, was fined $2.2 million for failure to safeguard portable devices and poor risk assessment and risk management. OCR found that MAPFRE did not have an adequate security awareness training program in place for their workforce. In 2011, an unsecured USB device containing the ePHI of 2,209 individuals was stolen from the company’s IT department. Despite the corrective measures MAPFRE indicated it would take, it did not actually start securing portable devices until 3 years after the incident. Children’s Medical Center of Dallas received a $3.2 million fine for multiple incidents where devices with unsecured ePHI were stolen. In 2010 an unencrypted Blackberry was stolen with the ePHI of 3,800 individuals. In 2013, an unencrypted laptop was stolen with ePHI of 2,463 individuals. The OCR investigation discovered that the hospital did not begin to secure and safeguard workstations and portable devices until 2013 despite being aware of the risks for many years. Florida corporation, Memorial Healthcare System, agreed to pay a fine of $5.5 million. This ties Advocate Health Care Network’s fine in August of 2016 for the record of highest penalty. In this incident, the PHI of 115,143 patients was improperly accessed and disclosed. Memorial Healthcare failed to terminate a former employee’s log-in credentials which was then used to access 80,000 records with PHI over the course of an entire year. The company also neglected to review the activity within the system that would have identified that the records were being improperly accessed. Memorial discovered the breach while investigating two employees who were stealing patient information to file fake tax returns. Not too long ago, I posted an overview of OCR’s enforcement in 2016. OCR continues to be active in its enforcement, at its highest level to date. This is a great opportunity for privacy and security officials to point out to upper management the need for greater resources and attention to HIPAA compliance. Time to call the Guinness Book of World Records because HHS has set a new world record in HIPAA enforcement. 2016 saw a considerable increase in HIPAA enforcement resolution agreements and monetary penalties. At the end of 2016, the OCR logged over $20 million in fines for HIPAA violations from 15 enforcement actions with monetary penalties — a stark contrast to 2015 penalties which were just over $6 million from just 6 resolution agreements. The per entity fines have increased as well increasing from about $850K in recent years to $2 million in 2016. HIPAA is famously impenetrable, with so many special terms and definitions. 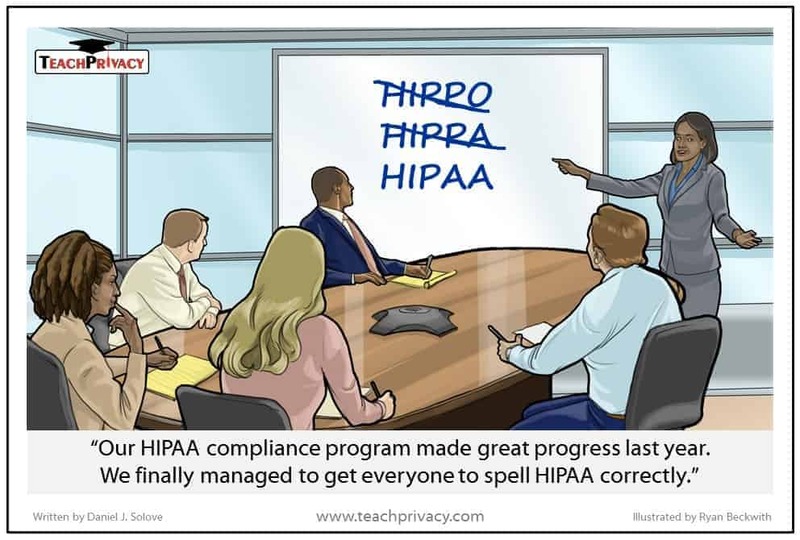 I wrote this cartoon to capture the wonderful world of HIPAA jargon, which I hope fellow lovers of HIPAA can appreciate. They are available through AHIMA, but you can preview them on my site here. These AHIMA HIPAA courses are not for the entire workforce — the courses are for personnel who focus on HIPAA compliance and need to understand the basics of how HIPAA works. My HIPAA training for the workforce is shorter as well as more basic and general. I have another HIPAA cartoon here. Recently, HIPAA celebrated its 20th birthday. HHS issued a celebratory blog post. HIPAA is 20 years old if you start counting from the date the statute was passed (1996). If we measure HIPAA’s age from the date that the HIPAA Privacy Rule became effective (2003), then HIPAA is 13. So HIPAA could be 20 years old, eager to become 21 and be able to drink (right now, it just makes people want to drink) or 13 years old and about to begin being an unruly teenager. Recently, the U.S. Department of Health and Human Services (HHS) Office for Civil Rights (OCR) issued its first resolution agreement and monetary penalty against a business associate (BA). I recently created a new resource page for the TeachPrivacy website: HIPAA Training Requirements: FAQ. I recently created a new resource page for the TeachPrivacy website: Text of HIPAA’s Training Requirements. This page provides excerpts of the training provisions in the HIPAA Privacy Rule and the HIPAA Security Rule. This page is designed to be a useful companion page to our resource page, HIPAA Training Requirements: FAQ. The FAQ discuss my interpretation of the HIPAA training provisions, but the full text of those provisions is located on the separate new resource page above. 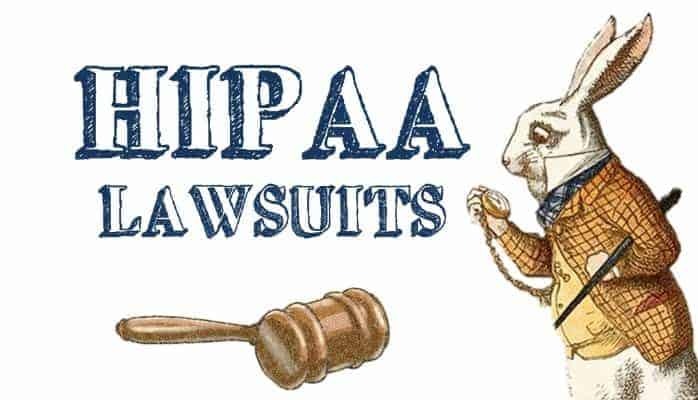 At first blush, it seems impossible for a person to sue for a HIPAA violation. HIPAA lacks a private cause of action. So do many other privacy and data security laws, such as FERPA, the FTC Act, the Gramm-Leach-Bliley Act, among others. That means that these laws don’t provide people with a way to sue when their rights under these laws are violated. Instead, these laws are enforced by agencies.